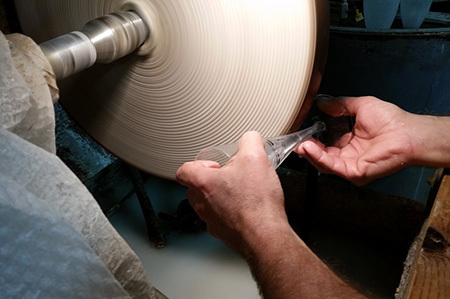 Is a grinding technique, used for many years, which allows to “dig” or carve the glass. It is carried out in several phases: The first phase involves the use of a very rough grinding wheel consisting of coarse-grained silicon carbide; the second a fine grain grinding one; the third a natural sandstone wheel, which removes all rough or sharp areas; the fourth phase a cork wheel which is soaked in a thick mixture of very fine pumice stone powder and water, necessary to polish the carved out pieces of the glass. Finally, the glass is cleaned on a cloth wheel using a mixture of cerium oxide and water and then rinsed in running water. Is a type of glass finish characterized by an uneven surface that show numerous slightly round and irregular or parallel notches ground into the glass surface. To perform this technique, the glass engraver must make sharp and regular indentations, round or oblong , on a grinding wheel of appropriate grain, which removes the shine of the polished glass to create opaque areas, pleasant to the touch. 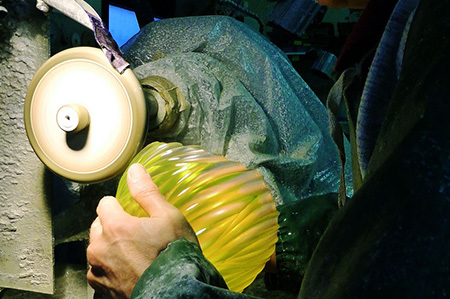 It is a technique that is typically from Murano and dates back to the 1930s. Glass engraving is achieved by using a small wheel of abrasive stone (which can be of various diameters and different grain, according to the type of engraving needed); It can also be metal (bronze) with the diamond surface. The actual engraving of glass has its origins in the etching of semiprecious stones that was done in Germany and Bohemia in the 16th century. At the end of that period it was introduced in Venice with the arrival of German engravers in cold work (or secondary processing) of Murano glass. 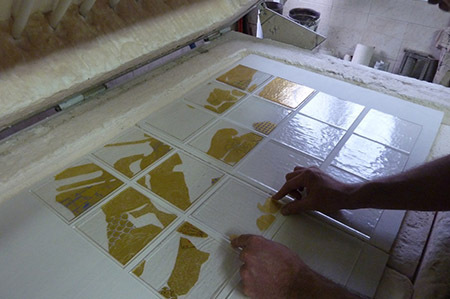 It is a very old technique, which also includes the glass mosaic. It is done by using different colors of glass, which are placed side by side on a plate of ceramic fiber and fused in an electric furnace to obtain a layer multicolored glass or glass mosaic. This operation can be repeated several times by superimposing the colors or layers, sometimes creating a three-dimensional decoration.